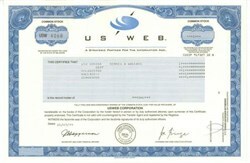 Beautifully engraved certificate from the US Web Corporation issued in 1999. This historic document was printed by the American Banknote Company and has an ornate border around it. This item has the printed signatures of the Company's Chairman and Chief Executive Officer ( Joe Firmage ), and Secretary Chief Financial Officer. Joe Firmage was co-founder, chairman and CEO of USWeb, which under his leadership became the largest Internet consulting firm in the world serving half of the Fortune 100, and a publicly-traded company with thousands of employees in North America and Europe. Firmage received Silicon Valley's Young Entrepreneur of the Year Award from Ernst & Young in 1998. In January Joseph P. Firmage stepped down from his post as Chief Strategist at USWeb Corporation in order to devote his full attention to the question of human contact with other intelligent life in the universe. Firmage, who co-founded USWeb in 1995 and served as its Chairman and CEO until November, 1998, was increasingly at odds with corporate colleagues who saw his outspoken interest in the UFO subject as possibly detrimental to the fast-growing company. Firmage said he did not want to burden USWeb with a "credibility deficit." But he also told reporters he now sees a higher calling for himself than worrying about corporate profits. Firmage has spelled out his views concerning the influence of extraterrestrial visitors in human history (he regards ETs mainly as "teachers," and says we have reached a time when our teachers of old want to make contact again) in a massive online "book" called "The Truth" posted at his website, Project Kairos.